Quick—what are the first five impressions you want guests to have when they visit your home? I’ll give you five seconds… 1… 2… 3… 4… 5… What did you come up with? Wouldn’t you be on Cloud Nine if these compliments were paid to you regarding your Toronto, ON home? I sure would. And, since last year—these are the exact types of responses I receive from my guest! How, you ask? Check out these three changes I made to my home to make it perfect. Now, I am not going to sit here and lie to you. I love old decorative items. But, I had some pieces from my college years that no longer had a place in my design. I’m nearly 40 years old—there’s no reason for me to have a papasan chair in my living room anymore. So, I got rid of it. I also did a thorough walk-through and inspected the walls; any cheap-looking or plastic picture frames came down and I replaced them with various sizes and styles of navy and cream coloured frames . Slowly but surely, the rooms began to look united. The small rugs I had on the floor were replaced with oversized area rugs I layered on top of one another; some were solid and fuzzy and others had hints of the same colours in my sofa. Instant décor facelift. Your Toronto, Ontario entry door is first to influence a guest’s impression. Mine was Plain Jane. I gave Brock Doors and Windows a visit and chose an extremely reasonably priced entry door with an auspiciously placed window, brass hardware, and a mail slot. I chose dark navy to complement the frames inside. My space feels so coordinated, now! I’m a bit of packrat, honestly. Plus, I like the cozy, homey feel that knickknacks and souvenirs offer. Though, I had overdone it juuuuuuust a little. I found some great totes and soft cube-shaped ottomans (from a flea market!) to stow items such as card games, board games, DVDs, and candles (I have them in excess—they don’t all need to be out until I plan to use them). Be honest and ask yourself: what do guests think and feel when they enter your home? I know you want them to feel warm and welcomed—so what are you waiting for? 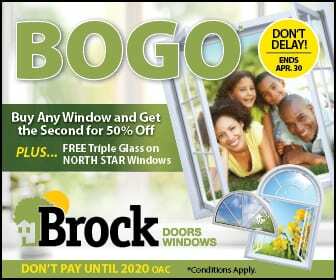 Walk around, make a few changes, visit a flea market, and give Brock Doors and Windows a call!